•Introduce yourself as student/staff/faculty/community member. 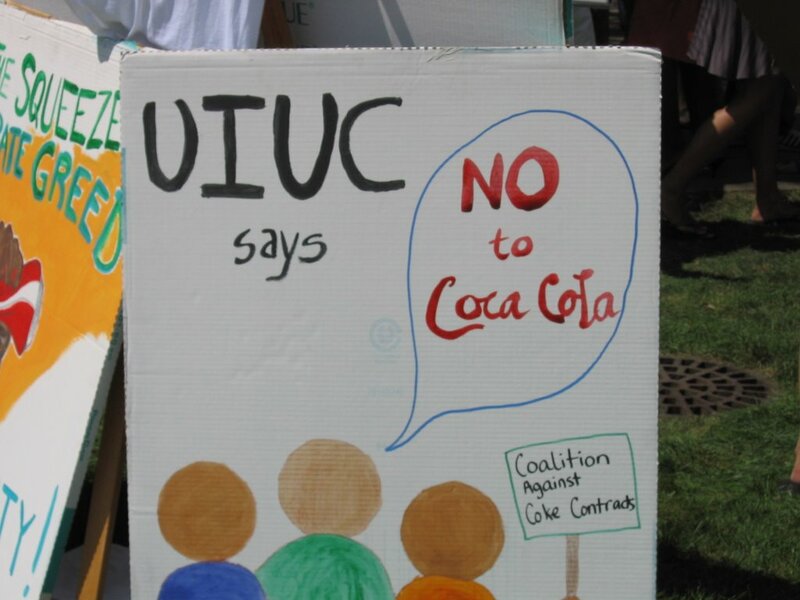 •" I am calling to express my concerns over university's exclusive beverage contracts with Coca-Cola. 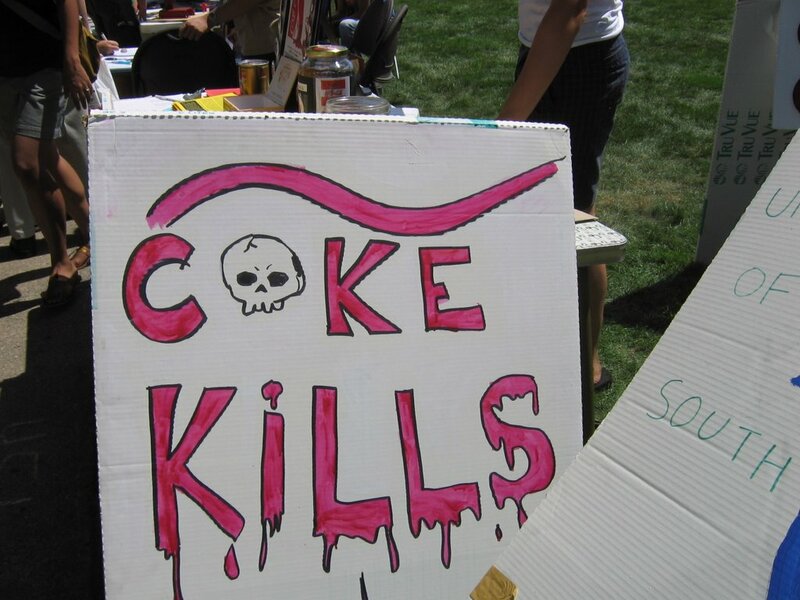 Coke is responsible for a number of human rights and labor violations, and environmental degradation. University of Illinois should NOT do business with a corporation that puts profits over human rights. 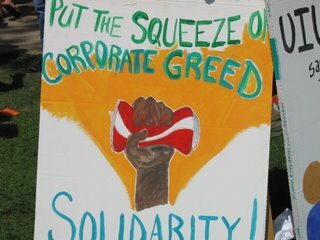 Please DO NOT renew the contract with Coca-Cola"
Please email us at[cokeactiongroup@riseup.net] after you make a call. 1.Why do we want Coke off campus? •Murders and Human Rights Abuses in Colombia: Since 1989, 8 union leaders from Coca-Cola bottling plants have been murdered by paramilitary forces in association with Coke plant managers. Dozens of other workers have been intimidated, kidnapped or tortured. There is clear evidence that managers of several plants have ordered assaults to occur and made regular payments to leaders of the paramilitary groups. 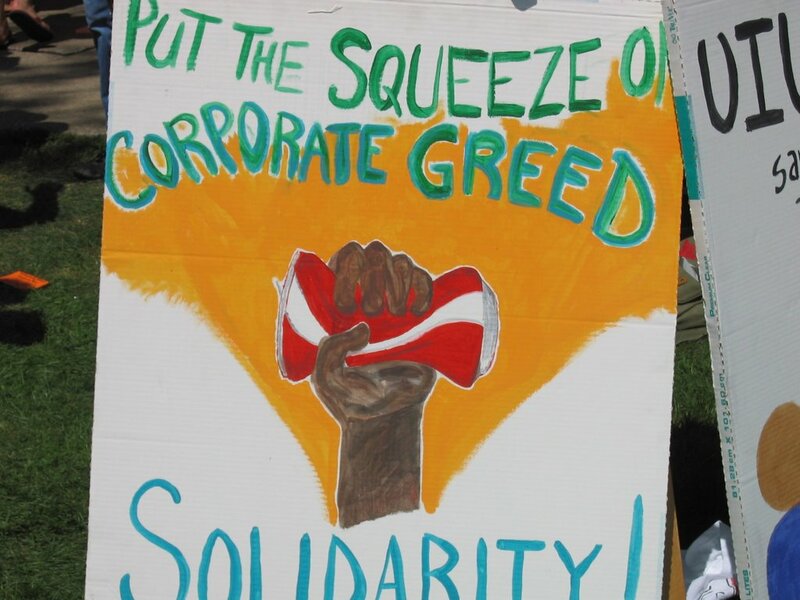 Union-busting has greatly benefited Coke and increased their profits. 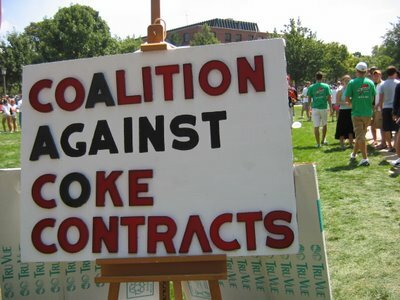 A court case filed in 2001 in Miami against Coca-Cola regarding these issues remains unsettled while investigations by Hiram Monserrate (2004) and Lesley Gil (2004) prove allegations are legitimate. 2.Distributing its toxic waste as "fertilizer" to farmers. The waste contains dangerous concentrations of cadmium and lead. 3.Selling drinks with high levels of pesticides —sometimes 30 times higher than EU standards. In a recent independent investigation the Center for Science and Environment (CSE) found dangerous levels of pesticide in all brands of Coke manufactured in India. 2. The contract is up for renewal in 2007, what is the purpose of calling this early? It is never too soon to decide NOT to renew the contract. The University should make the decision of non-renewal of contract with Coca-Cola as soon as possible and explore other options of beverage contracts. 3. Isn't this a matter of courts/independent investigation? The recent investigation conducted by Center for Science and Environment (CSE) is independent and on the grounds of their report, the Government of India is considering total ban on Coca-Cola altogether. Seven states in India have already banned Coke. Several campuses in the United States have decided not to do business with Coca-Cola because of the company’s egregious records. In the past, universities have never waited for a court decision to express their concern about the practices of their business partners or licensees. University codes of conduct grant them the authority to evaluate their licensees' compliance. its four multimillion-dollar contracts with Coke, the newspaper said. For complete story, click here Read more! The two places have been in the news for quite some time in the wake of agitations by local people demanding the closure of the plants of the soft drink majors there. 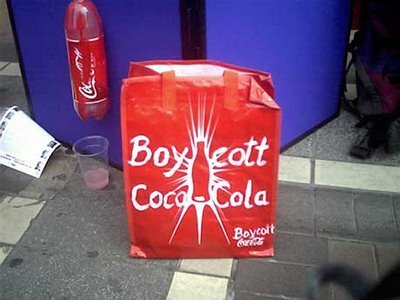 The Democratic Youth Federation of India (DYFI) took out a march to the Coca-Cola unit at Plachimada on Wednesday hailing the decision. 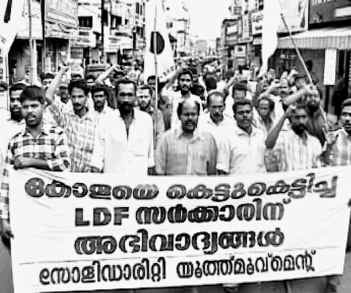 The Solidarity Youth Movement took out a march through the streets of Palakkad and held a public meeting at the town bus stand. Leaders of the Plachimada Solidarity Committee spoke at the meeting. Read the complete report Here Read more! 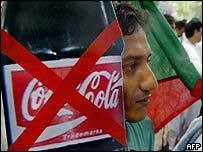 Trivandrum, India (August 9, 2006): The state government of Kerala in south India has banned the production and sale of Coca-Cola and Pepsi in the state. The companies will be asked to close their operations entirely. Chief Minister V. S. Achuthanandan stated today that the ban was being imposed because of the health hazards posed by Coca-Cola and Pepsi. "We have arrived at the decision to ask both Coke and Pepsi to stop production and distribution of all their products, based on scientific studies which have proved that they are harmful," said Mr. Chief Minister V. S. Achuthanandan. Chief Minister Achuthanandan also pointed to the four year campaign by the community of Plachimada in Kerala where the community has protested falling water levels and pollution of the groundwater and soil - directly as a result of the Coca-Cola company's bottling operations in the area. Read the complete report here: Read more! In a comprehensive study covering 12 states, Centre for Science and Environment (CSE) has found dangerous levels of pesticides in all samples of soft drinks. For more information, visit http://www.cseindia.org/misc/cola-indepth/cola2006/cola-index.htm Read more! San Francisco (August 3, 2006): Coca-Cola and Pepsico carbonated drinks in India contain dangerously high levels of pesticides, according to a new study released yesterday by the Centre for Science and Environment (CSE), a leading public interest research and advocacy group in India. CSE tested 57 samples of Coca-Cola and PepsiCo carbonated products from 25 different bottling plants across 12 states and found pesticide residues in all samples. The study found a "cocktail of between three to five different pesticides in all samples" - and on an average, the pesticide residues were 24 times higher than European Union (EU) standards and those proposed by the Bureau of India Standards (BIS), the government body responsible for standardization and quality control. * Heptachlor - which is banned in India and also has not been used in the US since 1988 - was found in 71 per cent of the samples, at levels 4 times higher than the proposed BIS standards. * Malathion - a pesticide that the US EPA recommends that workers wait at least 12 hours before entering the area of application - were found in 38.6% of the samples tested. "This is a grave public health scandal," said Sunita Narain, director of the Centre for Science and Environment and winner of the prestigious 2005 Stockholm Water Prize. 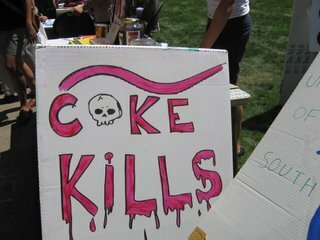 The latest study comes three years after CSE had found similar levels of pesticides in Coca-Cola and Pepsico products. One of the highest ranking bodies possible to be set up in India, the Joint Parliamentary Committee (JPC), was convened to look into the issue of dangerous levels of pesticides in soft drinks. In February 2004, the JPC confirmed the unsafe levels of pesticides in soft drinks, and recommended that the government set standards for these residues in the products. Since then, a committee from the Bureau of Indian Standards (BIS) has convened over 20 meetings to deliberate on the standards, and Coca-Cola, Pepsico, consumer and environmental organizations have all been consulted. In October 2005, the standards were finalized by the committee, and in March 2006, the committee met again to reconfirm the standards. The BIS has adopted the same standards as the European Union - which stipulates a single residue limit of 0.0001 parts per million and multiple residue limit of 0.0005 parts per million. The proposed standards, however, have been delayed from being implemented, ostensibly to do more research. The Centre for Science and Environment sees it differently. "Our reason is simple: if soft drinks contain a cocktail of pesticides above stipulated standard, they are unsafe. The companies say there are no stipulated standards. The reason is simple: they don't allow standards to be formulated. The standards that needed to be set to regulate their safety have been lost in committees or blocked by powerful interests in the government. The soft drink companies and their industry associations had fought tooth and nail against setting up a final product standard," said CSE in a prepared statement. The Centre for Science and Environment is demanding that the government implement the standards immediately and make the standards mandatory for the soft drink companies. Coca-Cola and Pepsico together control about 90% of the carbonated beverage market in India. The Coca-Cola company is also the target of community campaigns across India accusing the company of creating severe water shortages and pollution around its bottling plants. A number of studies, including those by the government of India, have confirmed the growing water shortages and pollution of groundwater and soil by the Coca-Cola company. One of Coca-Cola's largest bottling plants in India, in Plachimada in Kerala, has remained shut down since March 2004 because of community opposition and government action. There is also a growing campaign internationally that is applying pressure on the Coca-Cola company to end its abuses in India. 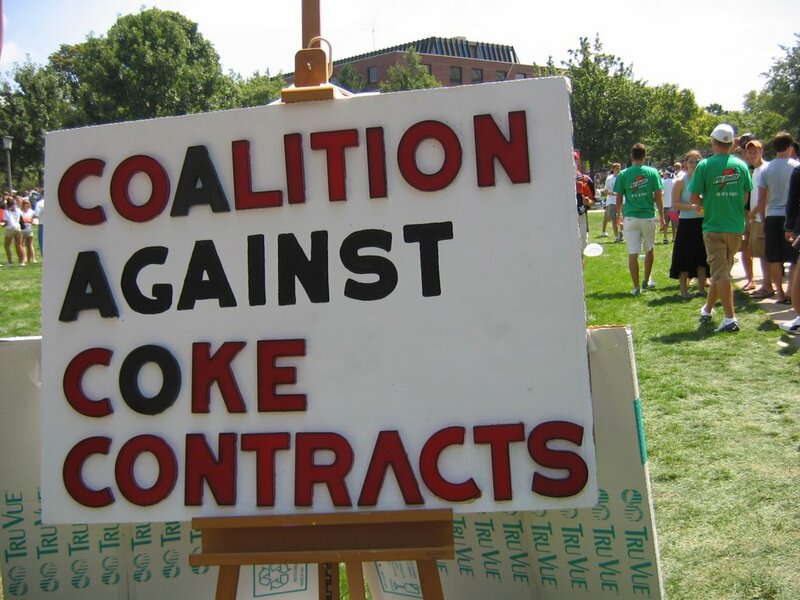 More than ten colleges and universities in the US and UK have taken action against the Coca-Cola company. The company was also recently ejected from the US$ 8 billion TIAA-CREF Social Choice Account because of the international campaign. TIAA-CREF is one of the largest financial services companies in the United States, with over US$ 380 billion in assets. "This is a classic case of double standards by a large multinational company in India. They are selling sub-standard products in India that could never be sold in Europe," said Amit Srivastava if the India Resource Center, an international campaigning organization. "It is Coca-Cola and Pepsico's responsibility to deliver a safe product in India, and they have failed to do so even after being informed that their products were toxic three years ago." 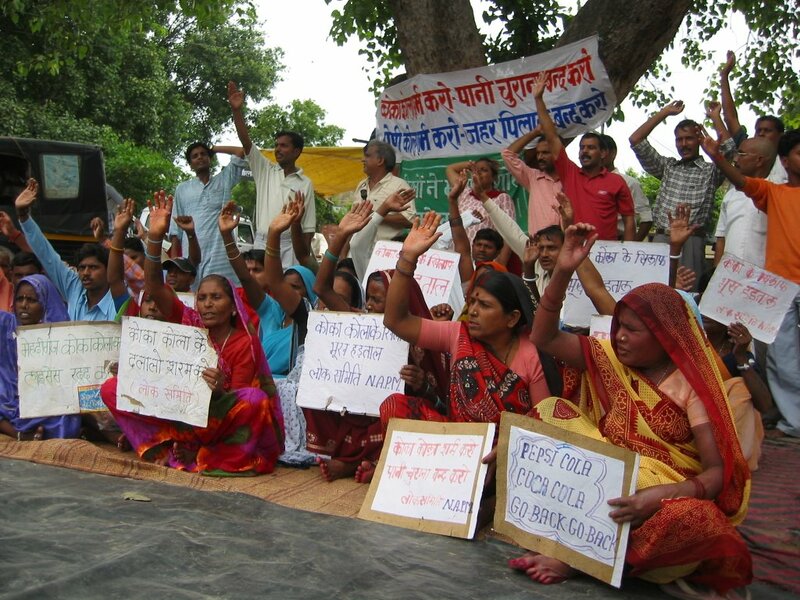 For more information on the campaign to hold Coca-Cola accountable, visit www.IndiaResource.org Read more! The University of Illinois at Urbana-Champaign has a five year exclusive contract with the Coca-Cola that is up for renewal in 2007. This exclusive contract implies that the only beverages you can drink on campus are manufactured by Coca-Cola. Coalition Against Coke Contracts (CACC), is a broad coalition of campus and community groups in Champaign-Urbana that has mobilized to demand that the University cut its contract with Coke since it has repeatedly violated labor rights in Colombia, and is responsible for severe environmental abuse in India. Join the CACC Facebook group! Are you drinking a Coke product?